It’s favorite things day on It’s Just Life. I have been down and out with some lovely illness that my sweet Mr. Diamond shared with me (isn’t that the sign of a great marriage?) it makes for an easy blog post with out much thought or preparation. 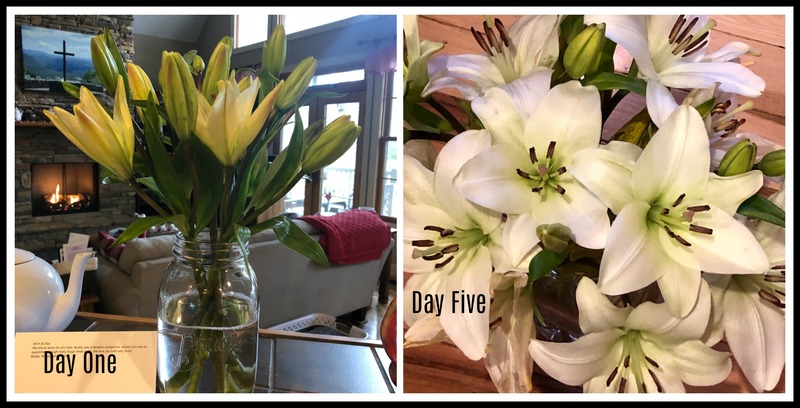 Hopefully by the time you read this I will be returning to the land of the upright but it’s been a tough week..
First up is a lovely bouquet of lilies that Micah and Wendy and Penny sent us after Buddy crossed the Rainbow Bridge. If you have not heard of Bouqs let me introduce you. Bouqs is an online flower delivery service but it is absolutely the best one I have found. When your box of flowers arrives (mine came via FedEx) they are basically buds that are on the verge of blooming. Cut the stems, pop them in water and they magically begin to open into loveliness. They are sourced from Ecuador, Colombia and the USA and you can read stories about the farmers on their website. I have received several bouquets of Bouqs and sent several and have been happy with them. Pro Tip: they are offering 25% off on their Valentine’s Flash Sale right now so check them out. Just click the link above to go directly to their site. I am not an affiliate of Bouqs – just love their products. Next up is a lovely fig spread. 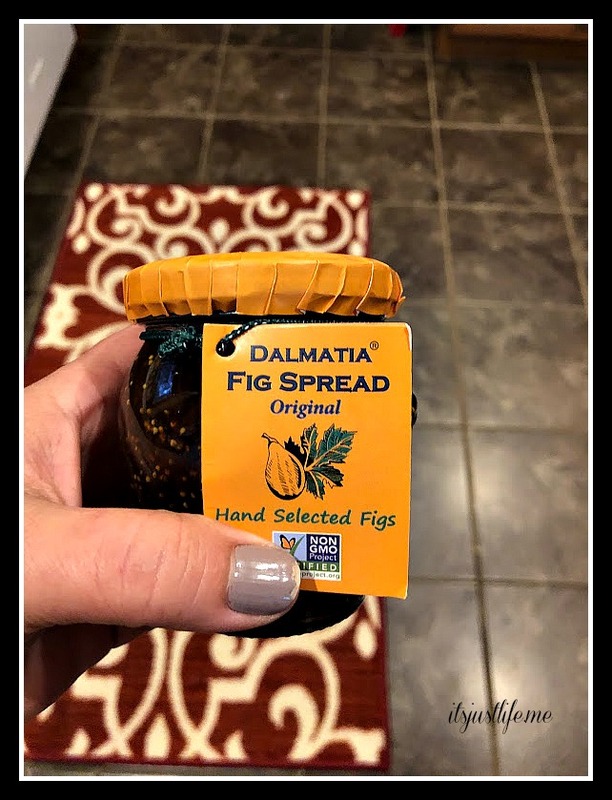 Fig spread? Don’t knock it until you try it. When we were in Croatia for Micah and Wendy’s wedding we fell in love with figs. Figs were everywhere and we found that we absolutely loved fresh figs. Fast forward to Christmas this past year and while we were at Aaron and Erin’s they shared this lovely fig spread with us. Spread on water crackers with some cheese and charcuterie and you have a winner. I found it in the cheese section of our Ingles by chance and was thrilled. Sometimes I get items from Influenster to try and then review. Sometimes they are winners and sometimes I am less than thrilled with the item but the last box they sent me I loved. 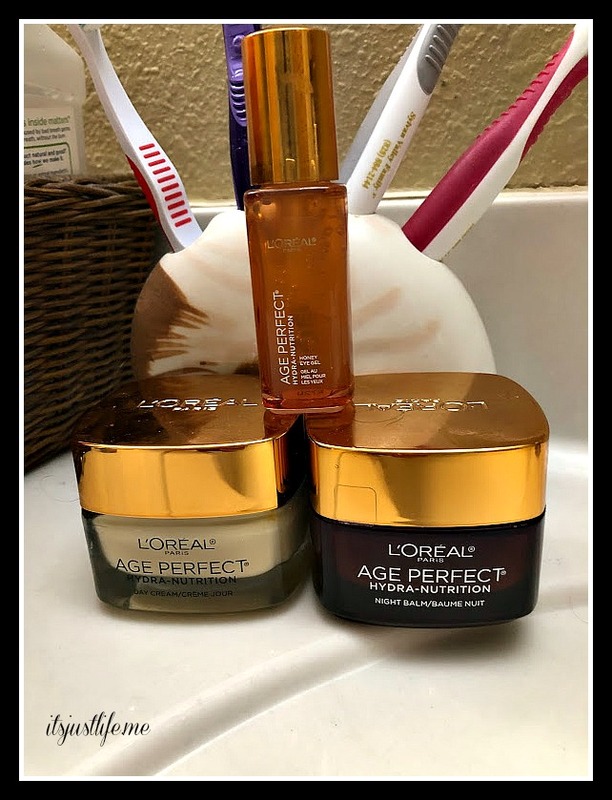 The L’Oreal Age Perfect moisturizing creams are fabulous and I have been using them for over a month now and have put them into my regime. My skin feels so much better when I use them and I am noticing firmer skin and less lines (aka wrinkles) around my eye area. I did receive these products free for review but I will be buying them when these run out. You can buy these products on line or at any drug store that you patronize if you are interested. Another body care product that I love I found at Bath and Body Works. You know how much I love the beach and anything beach related so obviously these are a win win for me. 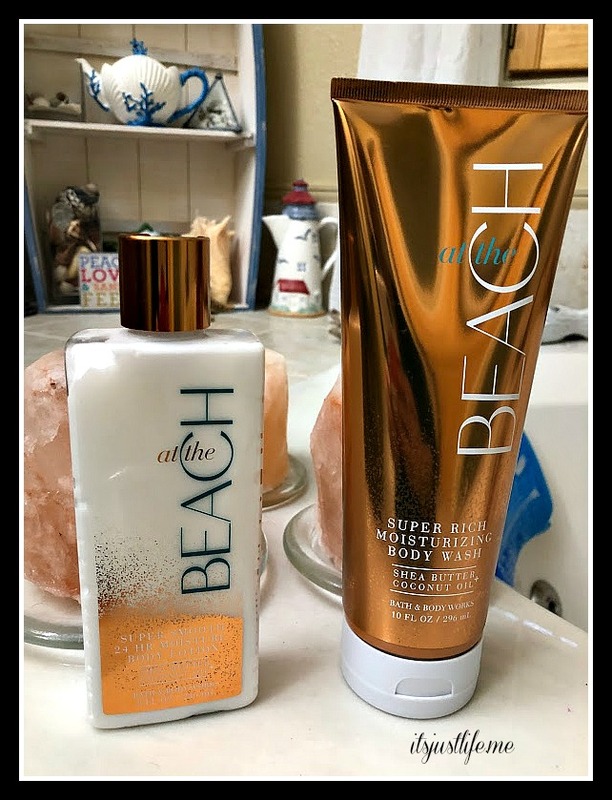 The body wash and lotion are rich and thick and lovely and the scent reminds me of all of the things that I love about the beach. 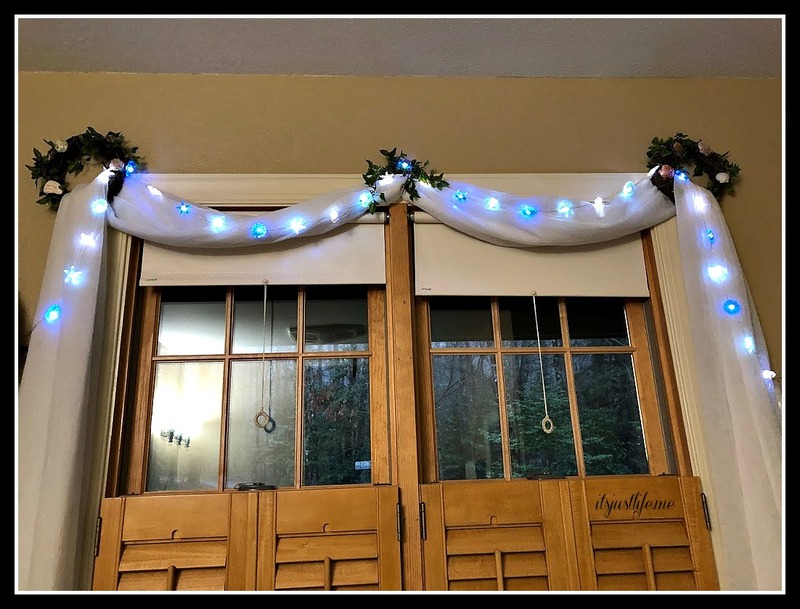 Speaking of the beach – I have a little beach retreat in my bathroom and Chris gave me these cute shell shaped lights for Christmas that I incorporated into my tub area beach theme. They even came with a remote and it has a timer and lots of different settings so it is super easy to operate these little lights that make me think of all things beachy. Finally I am in love with this cute cat doorstop. Our friend, Rod, who also made my Little Free Library made this for us after Buddy’s death. His wife and one of my very good friends, Lali, fixed us a delicious lunch (Pho) and he made this amazing door stop. I love it. If I haven’t said it before I will say it today –we have the best friends and people in our lives. We are surrounded by so many wonderful people and I count all of my blog readers among those. Thank you! I love “at the beach” lotion. Just gives you that relaxing and calm feeling! I agree! You guys could have used a boatload of this during your cold snap, right? At least you could have tried to fool your body into thinking it was at the beach! Lilies can be very fragrant so yes–if you are allergic these would not be the flowers for you!!! The fig spread is amazing and yes–it would be amazing on brie. Thanks for the kind words—I am finally turning the corner on this ickiness and feeling almost human again just in time for the weather to turn nice and warm finally. Yea! I’m going to have to check out that B&BW lotion. That fig spread is delicious. You got a good influenster box! The best thing in mine was some dry shampoo. I think I was reading that Estee Lauder acquired Loreal and uses similar forumlas in those products, it’s just that they’re more affordable. The fig spread is really top notch. I am almost to the end of the jar already and they have not had any the past 3 times I have been at Ingles so I am going to have to find another source. I didn’t know about the Estee Lauder acquisition but that makes sense. I haven’t checked the actual price on these products but it is worth it —it really is great product. You have me tempted to try the Sephora box thing with your post –other than the mushroom tea…. I loved the beach lines—and thanks for the tip on the moisturizers! I am always looking at facial and body creams!!! After that wicked polar vortex, I think we all are! Glad you are getting better! Fig jam is indeed delicious. We had some on a charcuterie plate and I couldn’t stop eating it! Page asked me what it was- I knew he wouldn’t try it if I said ‘figs’, so I mumbled “not really sure”. He tried it and then it was all gone! Loved the doorstop! And your beach-y lights! And…you! Thanks for sharing all these things that have made you happy during an especially difficult past two weeks with losing Buddies and dealing with crud. I agree with you about the supportive and loving family and friends. Life is so much easier and better with them (including you). Agreed! Fig is my jam! I like all your favorite things. Such a kind thing for your friends sending you the beautiful lilies. How cute is that door stop. The flowers and the wooden Buddy are both amazing and so thoughtful. And I strolled through Bath & Body today and bought the BEACH things, just like you shared here- Great list! I like fig paste too, but my favorite is the cat doorstop with the long tail making an easy-to-reach handle. Cool idea! What a lovely list of favorites you have! Love the beachy theme in your bath. And that kitty door stop was such a thoughtful gift. You are blessed, my friend, and I hope you’re feeling better by now.